Tonight is a Sunday dinner that I have been craving. Chicken and potatoes-- comfort food. The bonus part to this meal is that I am getting some prep work done for our Christmas Eve meal. I am making a big batch of our favorite Christmas salad dressing and I am making a double batch of tart dough. In the meantime, we will be enjoying these tasty tassies before the main event. Tassies are "little cups" made of cream cheese dough. Normally one sees them as a sweet mini tart, but this recipe goes the savory route. The dough is pressed into a mini muffin pan to form the "cups". Then they are filled with cooked pancetta, parmesan cheese, and a mixture of egg and half-and-half. Baked until golden brown, the dough is tender and almost flaky and the filling is reminiscent of a quiche. Add a dash of cayenne for some zip. These are a warm beginning to our Sunday meal, but they would certainly be welcome at a brunch or luncheon. The first time I made these we had a few leftover and they warmed up nicely in a preheated oven for a quick weekday breakfast. Fresh or leftover-- they are delicious and satisfying. In the bowl of a stand mixer fitted with the paddle attachment, beat the butter and cream cheese on medium speed until creamy. Gradually add the flour; beating on low speed until blended. Shape the mixture into 24 balls, place on a parchment lined baking sheet and refrigerate for 1 hour. Lightly grease the wells of a 24-cup mini-muffin pan. Place the dough balls into the cups, pressing on the bottom and up the sides to form a cup; set aside. Preheat the oven to 375º F. In a small bowl, whisk together the half-and-half, egg, and salt. Evenly sprinkle the cooked pancetta into the pastry cups; top with 1 teaspoon of parmesan. Evenly drizzle half-and-half mixture over cheese and sprinkle with chives. Bake for 20-25 minutes or until puffed and golden brown. Carefully remove the tassies from the muffin pan and transfer to a wire rack to cool briefly. Serve warm with cayenne pepper to taste. Cooled leftovers can be stored in an airtight container in the refrigerator for up to 3 days. Reheat in a 350º F oven for 5-10 minutes or until warmed through. Enjoy! Anytime-- would love to have you! Best. These look so good! 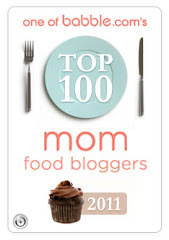 I think I may have to buy mini muffin tins asap! 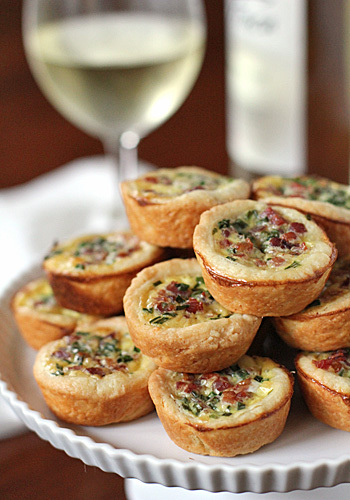 These tarts look amazing - perfect for holiday party appetizers.